What metals do you refine? We refine gold, silver, platinum, palladium and rhodium. What type of gold do you refine? We refine karat gold from jewelry, coins, gold scrap, filings, dental gold, polishings, gold dust and any industrial materials containing gold. What type of silver do you refine? We refine sterling silver jewelry, sterling scrap, industrial silver, silver coins (minted prior to 1965), silver flakes, flatware and tableware, photographic silver and silver electrical contacts. What type of platinum do you refine? We refine platinum scrap from jewelry, industrial platinum group metals, palladium and rhodium (wire, sheet, bars, chunks, plate, foil, flake, pellets, catheter tips, crucibles, etc.). Can I exchange my precious metal scrap for coins and bullion? Yes, you can exchange your precious metal scrap for coins, bullion, karat gold alloy, karat gold casting grains, precious metal bars, etc. We cannot refine gold-plated material, gold electronic scrap, automotive catalytic converters, silver-plated material, clad silver coins (minted 1965 to present) and computer board parts. Silver electrical contacts are accepted but must be removed from bus bars or connectors made of copper or non-precious metals. Can you refine 50 to 100 ounces of platinum on a regular basis? Is there a longer turnaround time with larger orders? No. Because we use the finest state-of-the-art techniques and equipment, we can handle any size lot with the same fast turnaround time of approximately 3 to 12 business days. Examples of turnaround times are: gold, 3 to 5 business days; silver, 3 to 12 business days; and, platinum, 3 to 12 business days. Is it necessary to remove any enamel or cement from dental gold scrap? No. These materials are vaporized during the melting process. Is it necessary to remove fillers or weighted material from sterling silver? Is it necessary to remove any unwanted stones from karat gold jewelry scrap? Do I have to remove my diamonds before shipping? Yes, please remove any valuable stone prior to shipping. Is there a minimum amount of precious metals I can send to be refined? Yes, the minimum is 3oz. or more of mixed karat scrap; however, we can purchase a smaller quantity of scrap outright, at a lower percentage. Do you charge a fee to remove Cadmium? Yes, $1.10 per incoming ounce or $400 minimum charge to remove Cadmium. Is there a minimum amount of material that contains Cadmium that I can send in to be refined? Yes, the minimum amount is 15 pounds. How do I redeem my coupon for a silver coin? When you send us your order, include this coupon to receive a beautiful one-ounce silver coin as our gift to you when you receive your settlement. We pay the first $20 in shipping costs with settlements of $6,000 or more. See the Shipping page for conditions and exclusions. Why do I have to fill out the AML form? AML form is part of the U.S.A. Patriot Act AML Compliance Program that protects both the client and the refiner against money laundering and funding the terrorist groups. AML form consists of two types - Individual and Corporate - please make your selection in the upper right corner of the form. Is Northern Refineries a member of BBB? 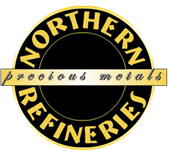 Yes, Northern Refineries is Better Business Bureau accredited member since October 2008 A+ rating. Can I walk-in to Northern Refineries facilities?